Breast health is an important issue for women, but it is just part of the entire health concerns that should be addressed. Many people don't realize that almost ten times as many women die of major cardiovascular disease as die of breast cancer. Breast health is an important issue for women, but it is just part of the entire health concerns that should be addressed. Many people don't realize that almost ten times as many women die of major cardiovascular disease as die of breast cancer. According to the National Vital Statistics Reports, Vol. 60, #3, Pg. 99, dated Dec. 29, 2011, 40,678 women died from breast cancer versus 397,874 women for major cardiovascular disease in 2009. To fully address women's health, we need to look at what is harming our health and work toward minimizing those causes and also focus on what increases wellness. It can be so overwhelming to know what to do to take care of ourselves that many women end up doing nothing instead. But, with Qigong, it is possible to create a simple self-care plan that addresses our most stressed organs and heals them. This article focuses on a chest exercise to improve not only breast health, but strengthen our cardiovascular system as well. Future articles will continue to broaden this self-care plan and add in exercises for other areas of concern for women. To fully improve our health, we must cultivate a deeper understanding of what our energy systems are in charge of and what factors influence their healthy functioning. Taking into account emotional and psychological effects and interpersonal relationships is especially helpful for creating a holistic approach to our wellness. Traditional Chinese Medicine (TCM) is a useful tool in understanding our health. TCM views the body as a network of interdependent energy systems called organ systems or elements. This theory is called the five elements theory. Each organ system has energy functions and affects us physically and emotionally and influences the relationships we have with others. The heart system includes the heart and small intestine organs and their pairs of meridians. The heart's energy job is not only to govern the blood but also the spirit, our sense of self, and our psyche. This sense of spirit/self is called shen. The heart energy gives us the ability to have a strong sense of community while maintaining our sense of individuality within that community. A heart personality would be a good communicator, a natural leader, connecting people and giving them a grander purpose. A heart person wouldn't order people around, but would connect them, creating a synergy that makes the group more than the sum of its parts. If the heart energy is out of balance, these people can feel a real sense of isolation or loneliness even if surrounded by people. They just don't feel that sense of connection or community and they long for companionship. Our sense of peace of mind comes from the heart system. When it's out of balance, a person can have trouble with anxiety and a racing mind that jumps from topic to topic. A racing heart or panic attacks can occur. They can have difficulty falling asleep at night or getting back to sleep if they wake up too early because the mind just starts racing. The more disturbed the heart becomes, the more trouble that person will have maintaining a hold on their thoughts and it can escalate from agitated to anxious, to panicky, to manic, to delusional. Emotionally, the out of balanced heart sees themselves as having something missing that needs to be filled. When out of balance, they tend to absorb other people to feel whole and when the other person can't maintain that level of enmeshment, the union falls apart. When the heart energy is strong and balanced you feel like you are complete but you desire to share and be known by others and to know them deeply. A strong and balanced heart person brings a synergy and fulfillment to a relationship that enriches both people. By balancing the heart energy, you can create healthy relationships with others where you can connect deeply without creating an enmeshed relationship. To promote a healthy and balanced heart, people need to create a more peaceful environment, do fewer different activities in a day, limit disturbing news or TV shows, and avoid caffeine and other stimulants. Next is the lung system, which includes the lungs and large intestines and their pairs of meridians. The lung's energy job is to absorb energy from the air we breathe and disperse it through the whole body, creating a rhythm and flow. Each breath sets a rhythm for the body, inhale receiving and exhale letting go. This sets a pattern for our energy that allows us to receive things and let them go. Being able to attach to people, places, or things in a healthy way and let them go when they no longer should be held onto relates to the health of the lung energy. Our sense of right and wrong, what we hold to be true or not true, our sense of ethics all come from the lung energy. Lung people have a clear sense of what they believe in. If someone's lung energy was out of balance, they could easily believe whatever the last person they spoke to said or the opposite could happen where their opinions are set in stone, becoming self-righteous in their beliefs. A lung personality would also have a great sense of order without it becoming restrictive or controlling. They don't like chaos though and have an innate need to see things organized. They often assume that they are better at organizing things than other people, but that is mostly because they just like things more organized than most others care about. An out of balance lung person can have difficulty letting go of past relationships which can make it hard to connect to someone new. When out of balance you can become over controlling and restrictive about what is allowed in your partner, becoming domineering with an overly strong sense of what is right or wrong. But a balanced lung person can connect and let somebody in without enmeshing with them, being supportive and having good boundaries, supporting individuality at the same time. A balanced lung person can create a sense of flow and structure that helps their partner to be more organized and successful without being domineering. To promote healthy and balanced lung energy, a person needs to get fresh air everyday with some aerobic exercise if possible, sit up straight so that each breath is full, eat more whole grains and vegetables that are high in natural fiber, and try not to take the world so seriously. 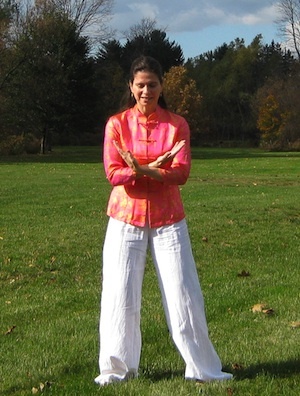 The following exercise is from the chest set of Health Balance Qigong and can be found in the Qigong for Women DVD (published by YMAA). This exercise improves Qi flow through the heart, lungs, breasts, upper torso, and the arms and hands. Place feet shoulder-width apart and arms relaxed by your sides. Inhale, then as you exhale, bend the knees and round the spine and turn palms to face upward and continue moving hands up in front of the heart, forearms crossed, palms facing each other as if holding a small ball. Inhale as straighten the spine from the knees up one joint at a time, rotating palms to face outward as extend hands out to each side at shoulder height. Keep the fingertips pointing upward as you rotate palms to face outward. Begin exhaling as you turn palms face down. Continue exhaling as you round spine and shoulders and bend knees, palms descend to waist, turn palm up and rise up in front of heart with forearms crossed again. Repeat. The breath is deep but relaxed and slow and fills the chest (chest breathing). On the inhale, visualize energy from the environment flowing into the heart and lung through their Mu acupuncture points. The Lung Mu is about an inch down from the outer edge of each collarbone near the shoulders. The Heart Mu is about a half inch down from the bottom edge of the breastbone. Visualize the energy coming into the lungs as white and the energy coming into the heart as red. As you exhale, gently allow any excess energy to flow down the arms to the space between your palms. To emphasize psychological healing—when the hands cross in front of the chest, imagine feeling safe and protected. As the hands expand outward focus on feeling open and connected. Practice just the movement with the breathing for a few days until you feel comfortable and relaxed. Then, try adding in the Mu points with the visualization of energy filling the organs as described above. Next, try focusing on the psychological healing by using the healing phrases listed above. Don't increase the complexity of the exercise too quickly. The mind must remain peaceful and unstressed during the exercise. Once you are comfortable with the movement you can add in more of the internal aspects of the form (Nei Gong). After a few weeks you will find that you can easily do both the Mu points and psychological elements simultaneously and feel completely relaxed. For health problems, repeat the exercise three times per day. For health maintenance, once per day is good. Only do as many repetitions in a row as feels completely comfortable and relaxing.